The star of the 1950s-era sitcom Happy Days, other cast members, and spin-off characters Laverne and Shirley spend the day in Milwaukee, celebrating the unveiling of a new life-sized statue of Arthur Fonzarelli in the city&apos;s downtown. 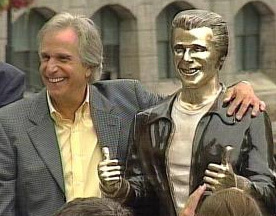 Henry Winkler, the actor who portrayed the Fonz for 11 seasons, says he&apos;s proud to have the bronze Fonz dedicated to him in Milwaukee. Winkler thanks his three families: his wife and kids, his fellow Happy Days cast members, and residents of Milwaukee who welcome him to the city. Winkler also thanks VisitMilwaukee.org for pursuing the idea and bringing the bronze Fonz to reality.